1.Peace Boat’s 59th Global Voyage for Peace : Peace Boat is a Japan-based international non-governmental and non-profit organization that works to promote peace, human rights, equal and sustainable development and respect for the environment. Peace Boat seeks to create awareness and action based on effecting positive social and political change in the world. Peace Boat pursues this through the organization of global educational programmes, responsible travel, cooperative projects and advocacy activities. These activities are carried out on a partnership basis with other civil society organizations and communities in Japan, Northeast Asia, and around the world. 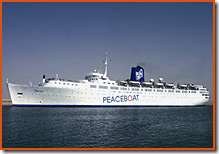 Peace Boat carries out its main activities through a chartered passenger ship that travels the world on peace voyages. The ship creates a neutral, mobile space and enables people to engage across borders in dialogue and mutual cooperation at sea, and in the ports that Peace Boat visits. Activities based on Japan and Northeast Asia are carried out from our eight Peace Centers in Japan. 2.Current Voyage: Peace Boat’s 59th Global Voyage for Peace will travel for 109 days around the world, departing Yokohama, Japan. Voyage commenced on September 23, 2007 and scheduled to complete on January 10, 2008. Peace Boat will return to the South Pacific and summer in the southern hemisphere to welcome the new year. Peace Boat will take an equatorial route passing through the Suez and Panama Canals, and visit places such as Viet Nam, Jordan, Cuba and Peru among 21 ports. The goal of Peace Boat is to spread a global message of peace, cooperation and taking concrete steps to build a better world. While the majority of participants are young adults and retirees, the youngest passenger is the tender age of six and the oldest is 89. In addition to the participants from all over Japan, 21 countries are represented as part of Peace Boat staff, volunteer language teachers, and ‘communication coordinators’ (interpreters), and scholarship students. 3.Presently at Kochi: ‘Peace Boat’ with 1,075 people onboard has arrived in Kochi. While 997 passengers are from Japan, others hail from various countries including United Kingdom, New Zealand, Australia, Eucador and Malaysia. Around 700 passengers have disembarked from the vessel and would be visiting various places of interest in Kochi, known as the ‘queen of Arabian sea’. Kochi Mayor Mercy Williams and officials of the civic administration are expected to visit the vessel as part of the peace initiative. A Yoga session and a friendly football match have been planned for the passengers at Fort Kochi. Forty-six passengers, who had disembarked from the vessel at Singapore, the last port of call, and had visited Delhi and Agra, would be joining the vessel in Kochi. Kochi is the ship’s third port of call since it embarked on a voyage from Tokyo on 23rd Sept. The vessel is scheduled to leave for Aquba in Jordan late on Wednesday, 10 October 2007. Old Sailor wishes Happy Sailing. 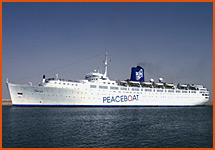 Peace Boat’s 63rd Global Voyage for Peace has commenced from Yokohama, Japan on September 7, 2008 and is expected to conclude on December 18. The Peace Boat ‘Clipper Pacific’ with 102 Hibakusha (atomic bomb survivors) arrived at Kochi today and is expected to sail out in the evening. Read more from WebIndia123.